2013 was when I began to get anxious. I'd been working in retail, I'd studied retail, and I tried to be an informed consumer. With time, I found the waste we leave in our trails disheartening and jobs in the retail industry are generally not well-paid. My happiest purchases are those where I feel connection to the maker. 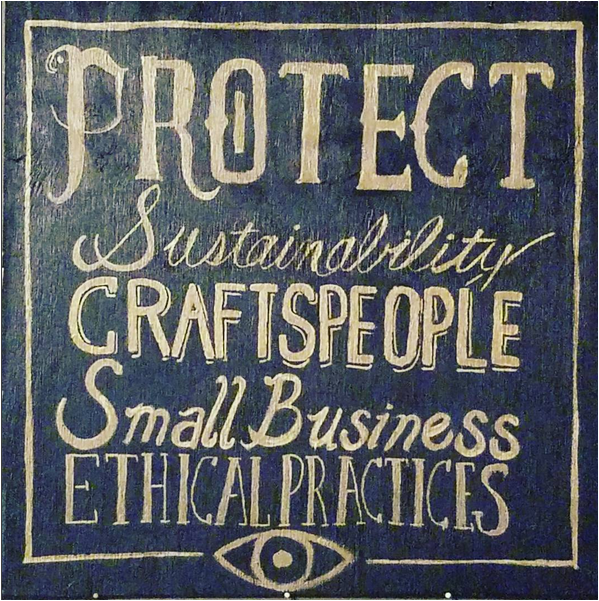 Often times, it seems that not only do those products gain quality from skill and knowledge of the craft and the hands-on process of small batch production, but those makers tend to align with values of sustainable sourcing and fair labor practices. Farmer's markets aren't always convenient and I'm not much of an Internet shopper. Though the web has some benefits, I'd strive to keep a diverse and thriving small business community as seen in tourist towns and even smaller cities. It struck me that what I envisioned was right out of the past. Chicago's got great small business, but nothing's in my neighborhood to the tune of that classic old fashioned community general store! I wrote a business plan and began to ask around to see if friends could help make this happen. I was looking for a year's capital in the bank to open doors with. By September 2016...I had exactly $10,000.28. I felt stuck but encouraged more than ever to create an enterprise which served to protect the environment, animals, and social justices. With Winter approaching, I bargained with a private landlord to create a small version of my plan with a 2-month lease. I hired a couple of students and a wander-luster - a wonderful crew to help man the ship while I was at my full-time department store job 50+ hours/ week. We called the pop-up shop Evil Eye Mercantile with symbolism standing for protection. In many cases, this product was/is not yet carried in Chicago. I'd like to connect customers with fantastic small brands from all around the States. I often seek out brands which are American Indian owned and operated. I also seek out brands which use renewable energies and sustainable packaging. 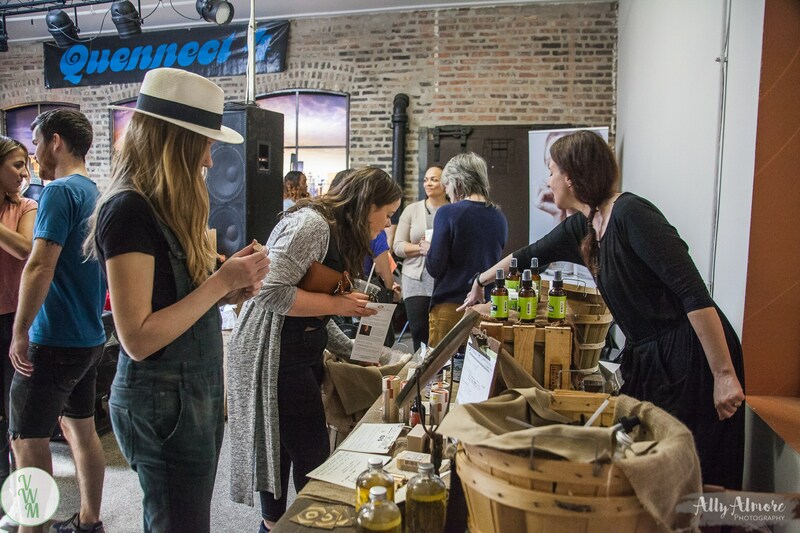 During the pop-up-shop we carried everything from soaps and lotions to herbal tonics, bottle openers, & chocolates. In a permanent space I will seek to carry absolutely anything a customer would want to grab at their general store and look forward to building rapport so that we can fill those needs! What we offer goes beyond great products. I believe that learning about and educating others on all the great things going on in our world is beyond putting a value on. Each of the brands carried was asked to share a cause which they felt great about and Evil Eye Mercantile gave 5% to protect those causes. On the scale that we're at so far that doesn't amount to so much monetarily, but my hope is that by promoting those organizations alongside the brands of our makers we will connect new fans to them and nourish positive thought. Sure, it was a struggle of a season across the board for retailers, but we weren't ready to leave! We signed up for 2 more months and headed into Holiday 2016! If you happen to be acquainted with the sorts of overhead involved in launching a small business, you may appreciate the budget and the compromises. Advertising was limited to social media and flyers on street poles and coffee shop cork boards. Consequently, customer base was generated by neighbors telling neighbors who told neighbors. In the end, I suppose that's fitting. I mean, it is just how an old general store would have become part of a community, isn't it? We grew revenue a little each month, but not enough to hurdle start up costs without more savings. At the end of January we held a vegan benefit event for Factory Farm Awareness Coalition, hugged and high-fived, and turned out the lights on that chapter of this venture. Currently, you can find me setting up shops at local markets whenever my full-time job allows. Chicago has a very strong vegan community. Since almost all product sourced is free of animal product (some products do contain beeswax, honey, or unverified sugar) there is much to share with this thoughtful and engaging group of consumers. Even when our brick-and-mortar doors are open, we'll keep popping up about this city to spread the good goods! We'll continue to look for ways to improve upon our footprint. We currently re-use packaging materials in web order shipments and our brands often reuse packaging from their suppliers. We'll plan to offer reusable canvas totes as alternates to our paper bags. My desire is to build a venue of ideas in this community store. As it grows, I want to continue to offer creative ways to reduce waste such as promoting refillable product packaging. I want to engage our guests with workshops and guest lectures to inspire action in saving our planet and building a more universally abundant world. I'm constantly inspired by ideas in the community of ethical brands and what they're doing in other markets. If it can be done in Austin, Boulder, & Portland I know Chicago can do it too! Please help me make this a reality! This can be done on a reasonable budget and I can be very frugal but sooner is better because there is SO MUCH heartful work to be done! Though I studied retailing (Syracuse University) and marketing (University of Illinois at Chicago) and work in a department store, it honestly bores me when people talk about the things they have bought. Most everything I own I've had for 20+ years and the products I buy are almost always with thought. I feel grounded in the past in that I am always inspired by the stories of adventure and exploration which precede us. Some people around here know me from a little passion project I started about 5 years back.Vegan Tuesday Chicago started as a way to hold myself accountable for seeking out vegan food more often. As I found myself genuinely loving what I was discovering I wanted to share with others and encourage them to support these local businesses. I'm thrilled when my little directory finds itself useful to someone else and I am grateful for the certain sense of reflection and conscious consumption which moving towards plant-based diet brought with it. When you start being able to count how long you've been friends by decades, it's really something special. I'll leave it to you to determine how many decades I've known Kris! Plenty of years to be able to tell you that this endeavor has been in the works for a very long time. And that you'll be hard-pressed to find someone more passionate about conscious consumerism than Kris. I jumped at the opportunity to be one of Kris's initial investors. As a health coach and newish mom of a vivacious two-year-old (Nora), it's more important to me than ever to make healthy choices for my family, community, our animal friends, and the environment. But it's not particularly easy to be a conscious consumer. I love the idea of an old-fashioned general store where people can shop with confidence that their purchases are high-quality, fun and luxurious, while also supportive of the earth and our community. I hope you will join me with an investment of your own in support of a better world for all of us! For my day job, I'm a writer and communication consultant. But, my most important job is mom to our daughter, Morgan (dog Barkley too). My husband and I live in the Chicago area and care about the environment we're leaving for our daughter and future generations. That's one of the big reasons we're supporting Kris in this effort. She's smart, motivated and extremely knowledgeable, plus dedicated to giving back! Kris has already done the work for you by finding earth-friendly products made in the USA that you can feel good about. I've personally tried many of the products and have a number of favorites. This is an extremely worthwhile endeavor. Operations costs until regular business generates dependable revenue. (Utilities, employees, supplies, advertising, etc). Although the short-term run in late 2016 showed me that it's possible to run a store while holding my full time retail job, I would really love to devote my time to the store. This is my passion and I want to be there. I can make the business even stronger by being there. This stretch goal would allow me to pay myself enough to leave my full time job (and possibly look for a part time position near the store and home) and still pay my bills. I can then work at the store as many hours as it requires and hire part time employees for supplementary coverage. Note: I have not and will not take any pay from this business until this business is strong enough to pay me as a full time employee. If we can meet the $25,000 goal it will be enough to launch the shop but nothing goes to pay my personal bills until the business is first adequately solvent. *We can have more "polished" things like slightly more fancy signage and stronger lighting to make things stand out more! You know, things to attract more customers! *We can work on a private label line which we'll hope to launch in a couple of seasons. This line will make our branding stronger and encourage refillable packaging and return customers. However, it won't replace those lines which perform strongly, so we'll also look for ways we may partner with them to continually improve our message of sustainability. *This will also allow a more polished marketing/ advertising campaign so that we can reach a wider audience and drive success earlier on after launch. The sooner we get things rolling the more good we are empowered and enabled to do! Your kindness is invigorating! We may or may not know each other in real life but know that the many collective acts which keep this project bobbing along towards eventuality make me smile daily! No amount of negative thought or bummer days or sad news stories can erase the mending impact of good deeds done. Virtual hugs and shout-outs on Evil Eye Mercantile social media platforms and website are coming your way for sure!!! 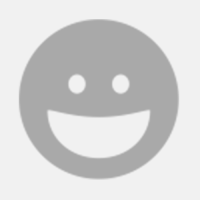 This is so super kind of You! A lot of people who are especially awesome sort of forget how awesome they are from day to day. We'll send you a couple of tins of our NON-GMO, allergen-free, USA-made, vegan, St. Claire's Organics breath mints. Each time you taste one, please remember that we're grateful for your being YOU! KAPOW! That's the stuff! You're really getting us rocking now! This kind of feels like a swift shot of FIRE CIDER. So much good stuff in one place for a healthier being and a clear state of mind. We want to be sure that you understand this analogy so that you understand how much we love You for this! So. You'll be seeing an 8 oz bottle of one of our best-selling products: this Organic, Non-GMO, raw tonic is a customer favorite. Oh! And you'll also get that social media shout-out and a fine tin of St.Claire's Organics. Yes! Let's make swag happen! Your choice of printed coffee mug or engraved highball glass to savor or toast the start of Evil Eye Mercantile! You'll also get a reusable tote because we're pretty sure you like to save the planet. We'll even start it off by filling it with an 8 oz bottle of Fire Cider and a tin of St.Claire's Organics mints! It started with a bright idea with hopes to sustain a business built on good deeds. Now, we forage for funds so we can plant our flag into some ground, scurry to make our shop welcoming to greet our first customers, and get ready to flip the sign to "OPEN". Before this happens, I'd like to take a moment to acknowledge the contributions which make it possible: Would You do us the honor of carving your name or a little message into our floorboards (or walls, as landlord permits)? We'd like customers to know that it's a community of kindness that made this business happen. How do they say...it takes a village to raise a child? Yes! This business is a baby and one day with the help of many caring souls OUR baby will grow up to do great things! Additionally, we'd like to share with you a trifecta of pampering products by Nature's Emporium Cherokee Soap Company (a customer favorite)! You'll get a candle, a bottle of lotion, and a bar soap in matching scents. This is a great brand for clarity, inspiration, and uplifting spirits. We're so appreciative to be Chicago's exclusive stockist! Yes, of course you know you're also going to get (say it with me now) a company tote, a higball or coffee cup, a bottle of Fire Cider, a tin of St.Claire's mints, and our social media shout outs of sincere gratitude!!! How did you GET so amazing? By day and night you fight for right and ALL earthlings are indebted to your being. If you take a look at the walls and displays which were at our pop-up shop you'll find authentically 1880s-1930s decoration sprinkled about for fun. It seemed to set the tone and slow people down to browse a bit. If you wouldn't mind, we'd like to get a portrait of your distinguished mug on our walls for posterity. (A black and white sketch/ caricature which will be framed & hung among other family photos). If you're local we can have you for a sitting. If not, choose a distinguished photo for our artist to work from. You'll get a copy of the finished work as well -to hang in your study, perhaps. Like our Friendly Founders, you'll get to carve your name or message into the boards in our premier shop! Oh! And, naturally, we'll send the tote, the glass or mug, the Nature's Emporium Cherokee Soap Co. trifecta, that Fire Cider, a tin of St.Claire's mints, and our social-media gratitude too! Ladies and Gentelman, the Party-Hearty Philanthropist is in the house. Yah! You ROCK and we wanna hang! There's going to be a private night of shopping and celebrating (this will be at the store in Chicago and likely early December). Please, Please, Please come join in & bring a guest for delightful libations, fun, music, and deeply-discounted shopping while you take a look at what you've made happen! We're looking forward to discussing ideas and sharing accomplishments by then. SO looking forward to this! Oh! If you haven't already carved your name into our store founders boards this will be a perfect opportunity. You can also selfie with that framed caricature portrait of you on our wall. Put the evening's shopping in your Evil Eye Mercantile tote, raise your highball glass to toast to dreams, and chat with our other contributors about how much you all adore Nature's Emporium, Fire Cider, and St.Claire's after you sampled the swag we sent! We will thank you until the break of dawn. (Although, we will still be considerate of noise and the neighbors). Can you do this? Really?!? Wow! Soon after we launch the brick and mortar storefront, we'll ask you about your favorite cause and we'll feature it in social media, website, print, and store display promotion. For one entire month 5% of store retail sales will be donated to your organization! Let's keep this good energy going! Yes, you're right! We want YOU to come to our private party in December! You're also going to get your caricature portrait and name engraved into our premier storefront; a Evil Eye Mercantile reusable tote, a coffee mug or highball glass; a Nature's Emporium trilogy of lotion, soap, & candle; the 8 oz bottle of Fire Cider, and the tin of St.Claire's Organic mints. And a partridge in a pear tree. (No. I'm kidding on that last one. I have no access to partridges and I'd feel terrible shipping them around if I did).